From the Shropshire Union Canal through the rolling Cheshire Plains to the Trent & Mersey Canal, the Staffordshire & Worcester Canal and back via the Shropshire Union the Four Counties Ring is one of the more rural Cruising Rings and is best savoured slowly. 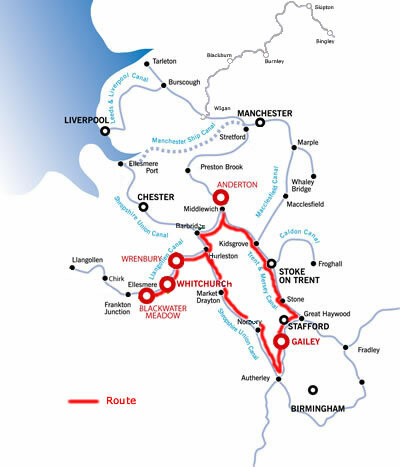 The four counties that the routes passes through are Cheshire, Staffordshire, Worcestershire and Shropshire. Experienced boaters can travel this ring in a week, travelling for about 9-10 hours per day, less experienced may take 10-14 days. The Shropshire Union canal, or The Shroppie, starts the journey at Autherley Junction (turn sharp right) in the outskirts of Wolverhampton, known to the working boatmen as “Cut End” due to it being where the Shroppie met the much older Staffordshire and Worcestershire Canal,Autherley Junction was once a busy place with workshops, a toll office and stables, today Autherley has a boatyard with a hire fleet and a club house. Many of the original buildings still exist and it is home to Bridge #1 on the Shroppie which is an original design by Thomas Telford. There is also the original shallow stop lock where Sam Lomas used to control boat movement and issue toll tickets. The lock has a drop of 1 inch, meaning no drop at all, so was purely used for Lomas's financial motives. Autherley is very attractive and full of canal history and it is worth giving yourself some time to look around! Chillington Hall, close to the village of Brewood (pronounced Brood), is home to the “Fancy Bridge” named by the workers who built the Shroppie. Powerful landowners demanded grand and ornamental bridges where the canal crossed their properties and this is a fine example of such work. A tree lined avenue crosses the canal here leading up to Chillington Hall which is now a venue for Weddings. Just a short distance upstream from Chillington Hall is Brewood and you will find shops, pubs and restaurants close at hand and there is also a boatyard all of which should meet any of your requirements. Just beyond Brewood you will see the Belvide Reservoir which supplies water for the canal. A very short distance from there is a cast iron aqueduct, the Stretton Aqueduct, which was built in 1832. It is used to cross the A5 Watling Street and take you onwards to Wheaton Aston where you will find the first lock on the Shroppie other than the stop lock at Autherley. The Wheaton Aston lock is unique by way of being the only singular lock on the canal route as the other locks are bunched together in "flights". This made for quicker working by the boat people because locks could be easily prepared in advance of the boats. At Wheaton Aston you will find a waterside garage that offers some useful facilities for boaters and a canalside pub. Wheaton Aston also has a few basic supplies. Once past Wheaton Aston you are headlong into beautiful countryside passing through deep wooded cuttings and embankments that give views for miles. During this section you will only pass though a handful of hamlets. It is so rural and remote that you can get lost in the peace, disturbed only by a nosy herd of cows as you cruise by. You will pass through Cowley Cutting, a cutting that is deep, narrow and wooded. This section was originally intended to be a part of the Cowley Tunnel which takes you into Gnosall, but the ground was unstable so they opened this section out and made it the cutting it is today, and naturally it leads you straight into the tunnel which opens out into Gnosall, which is convenient for stocking up on supplies or stopping for a pint and a bite to eat. Onwards from Gnosall you find yourself heading towards Norbury Junction passing over the infamous Shelmore Embankment. It took 500 men and 50 horses 6 years to build the mile long embankment which is on unstable land. This was the last section of the canal to be completed and the reason for Telford to never see his final waterway opened. Troubled from the start this section had to be repeatedly repaired. Today it is covered in mature trees whose roots help with stability and there are also flood gates at either end of the embankment in case of a breach. At Norbury Junction the Shroppie used to branch off to the Shrewsbury Canal via the Newport Branch and both of these are proposed for future restoration. In the one section of the Newport Branch that is still accessible there are moorings and a dry dock. Norbury is full of facilities including a British Waterways office and maintenance yard, a large pub, a café and a boatyard with a hire fleet and plenty of moorings. The Norbury area is very popular with walkers as it is a very pretty place with lots of wildlife. Expect it to be busy on a sunny day! Heading north from Norbury you go through the mile long Grub Street Cutting known for the double-arched bridge which supports a telegraph pole. At the end of the cutting is High Offley, a small rural village with a lovely traditional canalside pub, the only civilisation along this stretch which is surrounded by fields and woodlands. There is also the high Shebdon Embankmentwhere you find another canalside pub the Wharf Inn which is a good place to stop for the night. At the end of the Shebdon Embankment is the Knighton Cadbury's factory. This was opened in 1911 and they had a fleet of narrowboats to transport their goods to the Bournville site. The last load to be carried by boat was in 1961 by “Charlie Chocolate” Atkins in his boat Mendip which has recently been restored and can be seen at the Ellesmere Port museum. Woodseaves Cutting and the impressive High Bridge is the next place on your journey. This is a magical place, particularly in Spring when the deep cutting echoes with birdsong, as it is now a Site of Special Scientific Interest because its geological importance. It is followed by Tyrley Wharfwhich marks the end of 17 lock-free miles with a flight of 5 locks which lower the canal by 10 metres. The locks were built of stone cut from Woodseaves Cutting. Telford’s original design had two gates and in the 1840s these were replaced by the current design with only one gate. The lock cottage is typical of Telford’s designs and is similar to other toll houses that he designed. It is the only lock cottage which has survived relatively unchanged. The locks drop you down into theTyrley Cutting which, with trees meeting overhead, resembles a green tunnel. Now onwards to Market Drayton. Market Drayton, the home of Gingerbread, is a market town which holds a market every Wednesday. It is also a lively boating centre with many moorings to choose from and several boatyards. The centre of town is an easy walk from the canal and there are plenty of shops to purchase supplies from along with the market where you can pick up good local produce too. The town has some beautiful architecture from timber framed houses to a stunning 14th century sandstone church. On entering the town you pass over the pretty 40 Steps Aqueduct so called because of the 40 steps leading up from the road to the canal. After departing Market Drayton you have a quiet 3 mile section before the next set of 5 locks atAdderley. These are a good “warm up” for the Audlem 15, the longest flight of locks on the Shroppie, which are around a mile away. Both sets of locks are set in beautiful settings with gorgeous views. Luckily there are a couple of pubs at the bottom of the flight of 15 locks so a well deserved drink can be enjoyed. The Audlem Locks have a total drop of around 30 metres from the Shropshire heights to the Cheshire Plain. This is another area that is popular with walkers, the towpaths are often busy with people taking strolls on nice days, and there is a gift shop to visit which is in an old mill. Audlem village is another place to get supplies in, just a short walk from the Shroppie, with most shops available along with a tourist information and post office. It is a good place to moor for the night having cruised for 8.5 hours to here. Further along from Audlem are the Hack Green Locks which are 2 locks within walking distance of the Hack Green Nuclear Bunker which was a secret bunker reserved to protect the privileged in case of attack during the Cold War. Today it is open to the public and it has a substantial collection of military and Cold War memorabilia, including one of the largest collections of decommissioned nuclear weapons in the world. If you are planning a visit to Hack Green be sure to check opening times to avoid being disappointed. Continuing the journey northwards to Nantwich there is another small cast iron aqueduct and a long sweeping embankment flanked by housing. Nantwich Basin used to mark the end of the oldChester Canal, but now it is the home to the Nantwich Canal Centre, which incorporates a shop, café, boatyard and hire centre. Nantwich is a beautiful town whose centre is a short walk from the Basin and has the largest collection of historic buildings outside Chester within the county of Cheshire and offers a varied shopping experience including a vibrant market. There is a lot of wildlife to be found along the canal here. We now leave Nantwich and find a changed canal, it is more winding and wider as we work our way north, which is more typical of an older canal than the Shroppie. At Hurlestone is the junction with the Llangollen Canal which traverses across Shropshire and Wales and from there it's just a mile to where the Trent and Mersey's Middlewich Branch is found at Barbridge Junction. Barbridge is a popular place for stopping with 2 pubs and a boatyard. Turn right here as we leave the main Shropshire Union Canal & turn up the Middlewich Branch. The Middlewich branch is an attractive and under-rated canal with some wonderful tranquil moorings. The canal crosses the River Weaver over an aqueduct as it approaches the village of Church Minshull which can be accessed between bridge 14 and 15. the canal continues through quiet farmland interspersed with woods until it reaches Middlewich, there are good moorings at the boatyard to the left of the junction. The town centre is in easy walking distance from the canal, and is known for its heritage events and festivals. Once a thriving centre for the excavation of salt, the canal played an important part in the success of the industry in the town. Since the decline of the salt industry, the town is is a little bereft looking, but is still a friendly place with a good range of shops and pubs to be found. The town is home to a popular folk and boat festival which runs for three days every year over a bank holiday weekend. It has been going since 1990 missing only one year due to foot and mouth. Folk musicians play at a number of venues, and it is estimated to bring in 30,000 visitors and 400 narrowboats over the course of the weekend. Upon leaving Middlewich the canal runs close to the busy A533 road nearly all the way to Sandbach, which is around 2 ½ miles away. Although the canal skirts around Sandbach there are moorings available giving the opportunity to go into the town and stock up on supplies, there is an open market every Thursday and a farmers market on the second Saturday of every month. Just past Sandbach is the village of Wheelock which marks the beginning of the canals ascent to Harecastle, the section is seven miles long and has twenty-five locks to pass through, between Wheelock and Hardings Wood is commonly known as “Heartbreak Hill” which brings the canal to its summit level. Before starting the slog up Heartbreak Hill it might be an idea to stop at Wheelock for refreshments at pub or grab a bite to eat from a chip shop. You will pass the small village of Malkins Bank which is well known for its golf course, then shortly afterwards you reach Hassall Green where you will find a handy shop for stocking up on supplies. You may not wish to stick around here as the busy M6 crosses over the canal, but despite the thunderous noise of the motorway you may well decide to walk into the village to have a refreshing pint at the pub and enjoy the wonderful scenery. Now heading for Rode Heath and the unusual Thurlwood Steel Lock which was a guillotine lock built to counteract subsidence problems in 1958. It was never popular with boaters who chose to use the conventional lock next to it that wasn't affected by subsidence, as a result the steel lock was dismantled in the 1980's although the remains of it can still be seen to this day. Close by is the popular mooring spot by Rode Heath's canalside pub, there is also another pub in the village as well as a shop. The Church Lawton Locks ascend from Rode Heath, these locks are perhaps the nicest along Heartbreak Hill, set among woodlands with stunning views towards Mow Cop Castle, particularly lovely on a balmy summer evening. At Hardings Wood the Macclesfield Canal crosses over the canal by Pool Lock Aqueduct, the short Green Hall Arm takes boaters to a stop lock which is where the Macclesfield officially joins with the T&M. It is advisable to moor overnight here rather than closer to the Harecastle Tunnel in Kidsgrove due to reports of vandalism. Don't let this put you off visiting Kidsgrove though, it offers a good opportunity to pick up supplies, have a drink at a local pub or grab a takeaway. It is 10.5 hours cruising to here. The Harecastle Tunnel itself is just over 1½ miles long, it runs under Harecastle Hill. There is a friendly tunnel- keeper here and you must not enter the tunnel unless by instruction from him. There are actually two tunnels running parallel under Harecastle Hill, the first was built by James Brindley, there were many problems with the construction of the tunnel, it took eleven years in total to build, by which time Brindley had passed away. At the time of its construction the tunnel was twice the length of any other tunnel on the network. The narrow tunnel became a bottleneck for boaters, so some sixty years later Thomas Telford was employed to build a second tunnel and the two tunnels were used until the early 1900's when Brindley's tunnel was abandoned. Telford's tunnel is still in use to this day, there is a one way system in place, and passage is controlled by tunnel keepers at either end. You can still see the closed entrance to Brindley's tunnel although you can't approach it in a boat. You may well see the Kidsgrove Boggart on your journey through the Harecastle Tunnel, this is rumoured to be the ghost of a young woman who according to legend was decapitated and her body thrown into Gilbert's Hole, a coal landing stage within the tunnel. She is now said to haunt the tunnel appearing as either a headless woman or a white horse. Local miners used to believe that if she was seen it was a warning of a forthcoming disaster in the mines. There is, however, no record of any such murder taking place, and it's possible that the story may have been inspired by similar tales from Crick Tunnel on the Grand Union Canal or Rugeley which is also along the T&M. The Harecastle Tunnel emerges into a long narrow strip of woodland on the outskirts of Tunstall which marks the start of the heavily urbanised area of The Potteries around Stoke on Trent which holds sway over the canal for the next 7 or 8 miles. The canal cuts directly through the middle of this sprawling conurbation set in amongst hilly valleys and areas of reclaimed industry and the beginnings of large scale redevelopment. There are large brownfield sites throughout Stoke but also large areas of parkland to be seen from the canal. Aside from the world famous pottery industry in Stoke and the museums relating to them such as the impressive Wedgewood Museum, Trentham Gardens are worth seeking out on the south side of Stoke. There is a wide choice of shops to re-stock provisions on the journey through Stoke, as well as The Potteries Shopping Centre for all non-food shopping needs. The junction for the Caldon Canal breaks off to the left in the middle of the city, bearing off to the east towards Leek at the Etruria Junction, site of the Etruria Industrial Museum on the canalside. The Trent and Mersey continues south past Longton to the east and the Stoke City football stadium heading towards Barlaston. Trentham Gardens can be found a short walk to the west from Bridge 106 on the southern fringes of Stoke. After the Busy and sometimes noisy pound through Stoke the fields surrounding Barlaston and the wooded areas beyond are welcome. The canal drops into Stone from the north east with open fields and wooded areas to the right forming a green barrier to the urban development beyond, the bulk of Stone lies to the east bank. There is a profusion of services and shops in Stone for those who prefer to shop in a quieter environment than Stoke could offer with the High Street being pedestrianized and lying just a short walk from the canal it is very convenient. South of Stone the trees surrounding the canal thin out somewhat opening up views of land that is flatter than a lot that came before it giving far reaching views across endless farmland. It is slightly unfortunate that the canal just can’t seem to shake the busy A51 road and the railway line but noise aside the cruise at this point is picturesque. If the road and rail to the east is too much the River Trent makes a fine constant companion on the opposite side. The open countryside is punctuated by the occasional coppice of trees or sleepy village, most offering a welcoming local pub to drop into including Burston, Sandon, Salt but shopping opportunities are a bit thin on the ground . You will be getting weary now so stop at Salt for the night as there is a pub here- The Holly Bush inn, reached southwards over a stile then onto the lane from Bridge 82. It is 11 hours cruising to here. Soon the canal arrives at the Great Haywood Junction. Great Haywood is where the Staffordshire and Worcester Canal meets the Trent and Mersey, and you turn right down the Staffs & Worc canal, you are now on the home run. The beautiful surroundings of Tixall Wide lie just a short distance along the Staffs and Worcs which are most certainly worth a little exploration. Shugborough Hall lies just to the south west of the junction . Journey through the historic estate of Shugborough and experience the nation's best 'upstairs downstairs' experience. Set in 900 acres of stunning parkland and riverside gardens with elegant mansion House, working Victorian Servants' Quarters, Georgian farm, dairy & mill and restored walled garden, which are brought to life by costumed living history characters who share their lives and powerful stories from the past with visitors. Explore Lord Lichfield's private rooms and hear the stories of one of the nation's grandest families, with NEW Shugborough Revisited. You now enter the famous Tixhall wide section of canal and Tixhall Gatehouse which is just a stones throw from the canal, as grand as most grand houses which is the only remnant of Tixhall Hall which burnt down long ago, well worth a short walk for a closer inspection. It is recommended that you leave enough time to enjoy Tixhall Wide, moor up, have a picnic or a walk and enjoy this impressive area as it certainly is a highlight of the cruise. Milford is the gateway to Cannock Chase and as a consequence can be quite busy in high season. In Baswich there is a footpath which leads into Stafford town centre where you will not be short of stores, pubs and facilities. From bridge 98 it is 1.5 miles into Stafford town centre (to your left) , there is a frequent bus service. In Stafford there are many shops & pubs- also good to visit is the Ancient High house- Four hundred years of history are waiting to be discovered within the walls of England's largest timber framed town house. Step inside and embark on a journey from Elizabethan days through the turbulent Civil War era to the more refined Edwardian period. Also visit Stafford castle: First built by William the Conqueror to subdue the rebellious population, the Castle has dominated the Stafford skyline for over 900 years. Uncover the secrets of the site through Norman times, the medieval period, the English Civil War, right up to the present day. Stafford has a great mix of national and independent retailers along the bustling high street, in modern indoor shopping centres, and in picturesque cobbled streets. Penkridge. 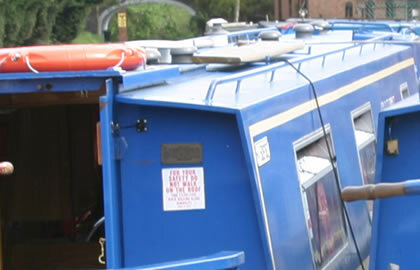 There is a small store at Penkridge Lock for basic supplies but if you chose to go into the centre there is a wide choice of shops and pubs. Above the lock is the best place to moor to visit this relatively old village. Gailey Wharf is soon reached above the lock.